Hayley and her father have lived on the run for the past six years to avoid dealing with her father’s PTSD. After an extremely bad incident, they return to their hometown so that Hayley can attend her senior year. Hayley is doing her best to keep her father’s unstable condition a secret, but as she gets closer to new guy Finn and her father sinks deeper into depression, memories of her childhood resurface and she starts to lose control of her life. Hayley’s voice is strong, sarcastic, and leaves an impression on the reader on the first page. 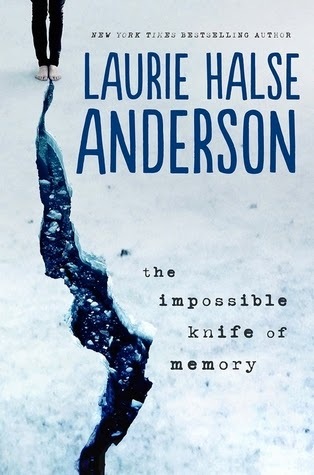 Her anger and fear are apparent through her disdain of her fellow classmates and her reluctance to be courted by new guy Finn, but as the story moves along, Anderson builds her character and reveals glimpses of a childhood full of disappointment and few happy moments with her father. Hayley remains closed off and distant to human connection throughout most of the novel, struggling to hold her life together and protect her father. It isn’t until she has the courage and the need to open up to those she loves—and resents—that she is able save her father, and create a future for herself. Anderson’s writing, as always, is precise and eloquent, unforgettable in its honesty and intense in its exploration of emotion and memory. Cover Comments: I really like how striking this cover is and the shades of blue used. Although I do look at it and think--man, that girl's feet must be freezing! Nonetheless, and I like how she's standing on the fault line. Very cool. This book will release next Tuesday, January 7th! The book sounds really great, and I'm glad Hayley's voice comes through strong, I think that's one of the things this author does well! Glad you enjoyed it. Wow. Thanks for this review. PTSD is always a compelling subject. Hayley is in a hard place, which makes for a great story.